Hi! Here are some opportunities for citizens to give public comment and/or interact with Spokane Police Department, as well as upcoming training for civilians. 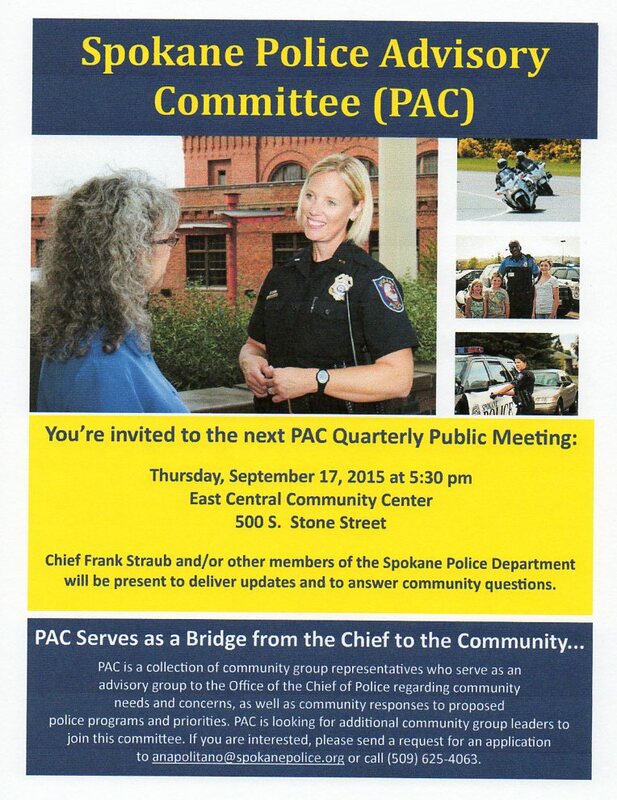 The Police Advisory Committee (PAC) is holding their quarterly public meeting on Thursday, September 17 at 5:30 pm at East Central Community Center. 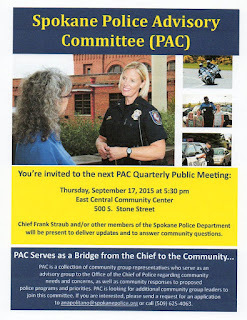 PAC will hold their regular meeting but it is open to the public and guests can ask questions and give input. Flyer attached. Enhancing the Survival Mindset (ESM) is a women’s self-defense class, which offers participants hands-on self-defense and safety awareness training by Spokane Police officers. ESM Level 1 will be held October 1st, from 6 - 10 pm. The ESM Level 1 course offers participants the opportunity to learn the basics of self-defense. The course consists of a classroom portion where participants will receive information on crime statistics, situational awareness, and information on enhancing their survival mindset. Hands-on training introduces participants to defensive tactics techniques and places participants into realistic threat scenarios. A participant's survival mindset will determine the outcome of these scenarios. Attendees must be at least middle school aged (allowed when accompanied by a guardian) or older to participate. There is a $35 charge to cover the costs associated with the class. Scholarships are available for those who need financial assistance. Enhancing the Mindset Level 2 is the next step in the reinforcement and development of the survival mindset. Participants are exposed to approximately six new threat scenarios that will enhance your schemas for real life survival. Attendees must be at least middle school aged (allowed when accompanied by a guardian) and older to participate and must have completed Level One. There is a $35 charge to cover the costs associated with the class. ESM Level 2 will be held on October 22nd, from 6 - 10 p.m.
To register and for more information about the classes, go to https://my.spokanecity.org/police/citizen/training/ or call the SPD Academy at 509-742-8100.